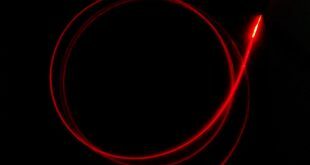 In photometry with sensitive detectors such as SiPMs or photomultipliers it is important to have a light source of adjustable intensity but above all a light source of low intensity or even very low in order to avoid that the sensor goes into saturation or that it is even damaged. Obtaining a light emission of this type requires some precautions. The simplest action that can be done is the shielding of the sensor by means of filters or the reduction of the sensitive area, for example by covering the sensor and opening only a pin-hole in the screen so as to greatly reduce the light that can reach the sensitive area of the detector. In addition to the shielding, it is convenient to have a LED light source, finely adjustable so as to easily obtain light intensities even very dim. The simple circuit that we present in this post allows the use of a LED in order to achieve the required functionality. As is known, the LEDs must be driven in current : the light emitted by the P-N junction of the LED is directly related to the intensity of the current flowing through the junction itself. 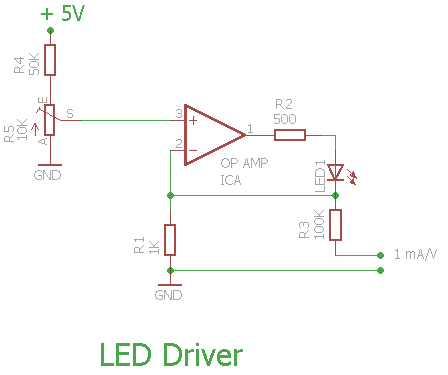 In order to adjust the brightness emitted by the LED, it is therefore sufficient to create an adjustable constant current generator. At the non-inverting input of the operational there is a finely adjustable voltage, from 0 to 1V, by means of a multiturn potentiometer. The operational generates a current which, through the resistance R1, generates a voltage at the inverting input equal to that set with the multiturn potentiometer. In this way, the current flowing through the LED can be precisely regulated. With the values ​​of the resistances shown in the diagram, the current obtained has a range from 0 to 1mA. The circuit was built on the TI OPAMPEVM evaluation board for Op-Amp shown in the image below. 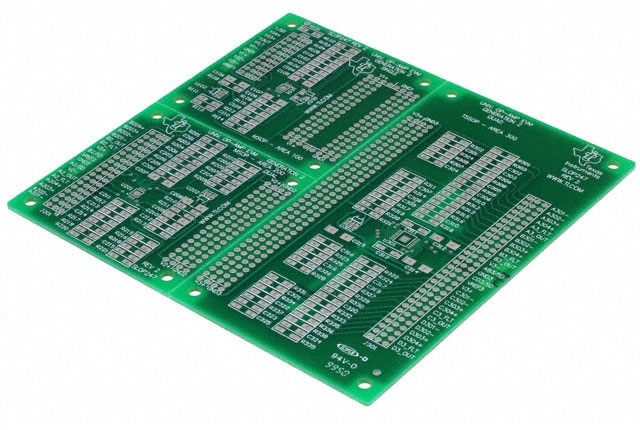 This is a very useful base because it allows you to make circuits with Op Amp (one channel, two channels and even four channels) on a high quality PCB substrate. The base is designed for through-hole components. Acting on the multiturn potentiometer we have measured the minimum current which causes the LED to light up. 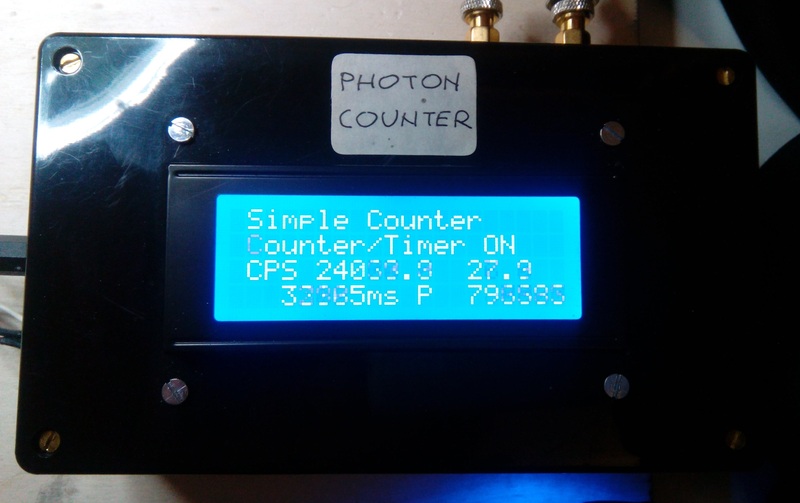 A PMT with a pulse counter (photon counter) was used to precisely measure the light emission of the LED. 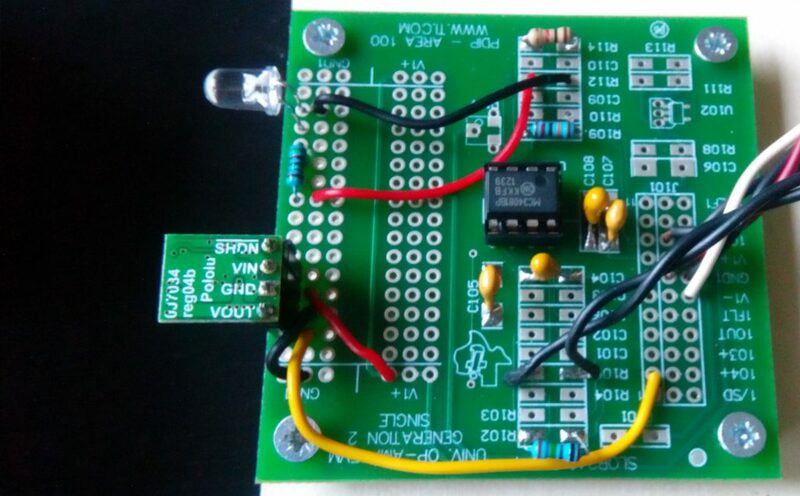 Slowly increasing the setting of the multiturn potentiometer you get a fast increase of the photonic count, from the dark noise value of about 40 CPS you go up immediately to values ​​of 1000 – 10000 CPS : this corresponds to the moment of lighting of the LED, as you can see in the image below. In these conditions the current supplied by the operational is extremely low, less than 1 μA, and is not measurable with a normal multimeter. Despite its simplicity, this circuit is able to produce extremely low currents, enough to turn on a LED producing a controlled flow of only 103 – 104 photons per second, useful for carrying out experiments and measurements with single photon detectors such as PMT and SiPM .